Over the years, I’ve come to inherit and keep watch over several server rooms for various companies around the Pacific Northwest. 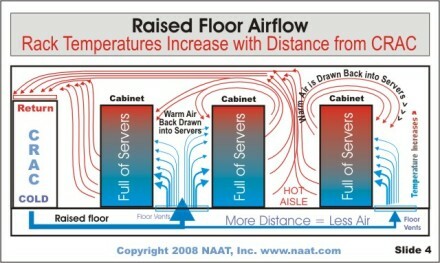 The recent heatwave got me thinking a lot about AC system design as it relates to server rooms. As is typical for small to medium sized companies, these server rooms have anywhere from 1 to 4 racks of gear per room, and use standard air conditionaing techniques to keep those servers cool. Being located in a temperate climate such as Seattle, where the annual average temperature is 54°F, it seems very odd to me that server room cooling systems here are designed the same way they are in southern California (and the rest of the world). Why waste all that money battling 120°F heat flowing out the back of your servers when you could easily vent that air and have a fresh supply of nice cold air coming in from outside, with no AC unit involved at all? Server room cooling easily consumes up to half of your server room’s total energy use, and since you’re a hot shot system admin, why not design something smarter (and save some cash while you’re at it)? In both homes and server rooms, traditional AC units are designed with two separate air spaces, creating a closed loop inside the house/server room. The AC unit takes in air from outside, passes it by the condenser coils to collect heat, then vents this hot air back outside. On the other side of the AC unit, air is being taken in from inside the room, passed by the expansion coils (also called evaporators) which absorb heat from the air, and vent this cold air back into the home/room. This is typical of just about all AC units… whether they are simple window units or complex ducted systems, the two air spaces are always kept separate. For homes that require AC only when it is hot outside, this is a great design. For server rooms that require cool air all the time, even during winter, this standard design lacks common sense. The standard AC closed loop design means you have neutral pressure inside the server room, so no air is moving in or out. 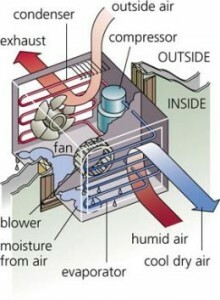 It also means you are using your AC unit to try to reduce the overall temperature in the server room so when the hot air exiting the servers mixes with it, the resulting temperature of the air getting sucked back into the front of the servers is at or below 80°F. For those of you in temperate climates with a lower average temperature, that means you are using the 50°F-60°F air outside to lower the server room temperature to at least 70°F, and paying handsomely for it. At night it gets even crazier as temperatures drop even further. Meanwhile, every HVAC installer or contractor you talk to first has no idea what you’re talking about when you suggest using external air, and further more many refuse to install it once you show them your concept drawings. WTF is going on? Why would anyone think that an AC system design meant for intermittent use in homes only when it’s hot outside is still the best design when it comes to server rooms that are “always on” no matter what it’s like outside? Here’s a classic example of how many server rooms are configured. 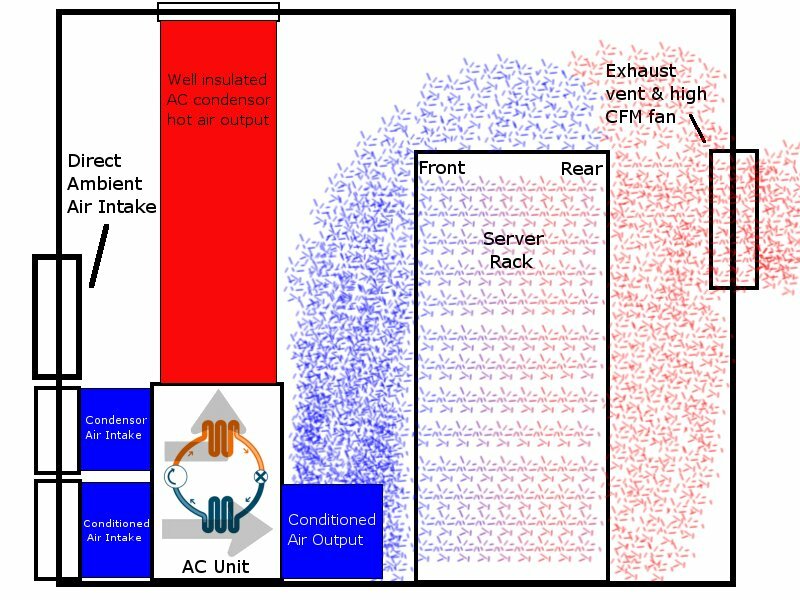 This illustration shows a multi-rack server room that uses a standard raised floor AC system, but the concept is basically the same with overhead ventilated AC systems. The first issue is the closed loop where the AC unit is fighting the hot air generated by the servers. The second issue is the poor air flow design in the server room results in the constant re-circulation of hot server exhaust being sucked in by other servers. The third issue is the increase in average rack temperature the farther away the rack is from the AC unit. 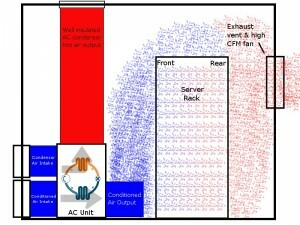 The biggest issue for most server room AC systems is the mixing of air in the datacenter. That means the AC must put out very cold air (40°F to 50°F) so when it mixes with the ambient air, the equalized temperature will land somewhere close to at least 70°F. That’s hard work considering the AC unit typically takes in 90°F to 100°F air, depending on placement of the air intake and air flow inside the server room. Here is a simple (badly drawn) design I whipped up in GIMP that uses external air. We simply change the “home/room” side AC unit air intake to accept air from outside, not inside the server room. This creates positive pressure inside the server room and keeps the AC unit in-line so when the air outside gets too warm, the AC unit’s built in thermostat will kick on the compressor and start actively cooling the incoming air. Add a vent to exhaust the hot air from your servers back outside and you’ve got an external air cooling system that only uses the AC unit’s compressor when the air outside gets too warm. For the Seattle area, that’s a maximum of 3 summer months out of the year… and during that 3 months, the AC would probably only have to work during the day as night temperatures typically fall comfortably below 60°F. By pulling in outside air, the AC unit only has to deal with external air temperatures, not hot server exhaust. 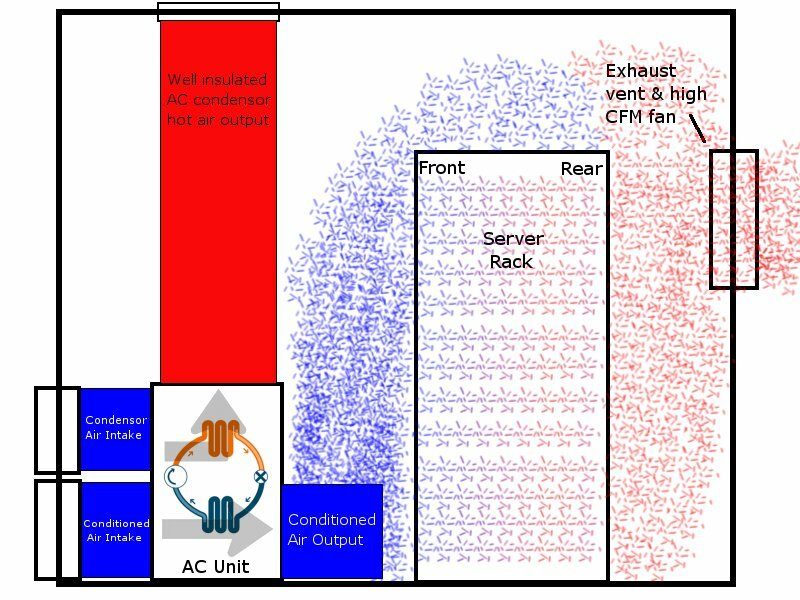 Also, by moving air through the server room in a single direction and venting the hot air directly outside, there is little chance for the hot server exhaust to mix with the cooler air coming in from outside. This airflow is essential, otherwise the hot server exhaust would mix with the cool outside air and raise the temperature at the server bezel. Only by properly managing airflow can we utilize 70°F air from outside with no AC unit compressor kicking on. The only down side I can think of to this simple design modification is that there is no way to pre-heat the air coming in to the AC unit if the temperature outside drops too far. I’m pretty sure pulling -5°F air into your AC unit would probably freeze it up, and it is definitely not good for your servers either. Probably a better idea would be to expand upon this simple design using thermostats and motorized dampers, “T”s, and “Y”s to control airflow. You could automatically recirculate some of the hot server exhaust into the AC air intake ducting when the temperature outside drops. This would pre-heat the air coming in and save your AC unit from freezing. Alternately, you could have two separate air intakes, one that runs through the AC unit and one that just comes in from outside. If the air outside gets really cold, the AC unit could be setup to shutdown completely so no air moves through it, and instead dampers could be used to control the amount of cold air coming in from outside. What I’m getting at here is that there are a lot of easy ways to make use of external air. It will significantly lower your server room energy bills, help realize true green computing, and lessen the impact on the environment. So come on all you smart guys and gals running server rooms out there, it’s time to put those smarts to use and re-think your server room cooling. This entry was posted on Wednesday, August 19th, 2009 at 7:29 am	and is filed under Server Management. You can follow any responses to this entry through the RSS 2.0 feed. You can leave a response, or trackback from your own site. Sounds nice, but have you considered humidity control? Even though the weather history for Seattle (http://www.cityrating.com/cityweather.asp?city=Seattle) indicates a maximum average relative humidity of 88% for October, I’ve used RH sensors both inside and outside many of the server rooms here in the Seattle area and outside it always hovers around the 50% mark. Some days it’s down around 40%, others it’s up around 60%. On the other hand, the operational specs for my HP DL360 G5 ProLiant boxes are 10% – 90%. Humidity is a factor for humid climates, but for the types of temperate zones I’m talking about, it shouldn’t be a concern. Worst case, one could use a humidity sensor coupled with a microcontroller or other PLC/machine automation solution to kick on the AC or even just a dehumidifier. We live in FL and the humidity is horrible. That design would not work too well for us but sounds like it would be great in a cooler/dryer climate. We have turned to geothermal air conditioning instead, which is 3-4 more times efficient than the average HVAC system and they are environmentally clean. Plus, you can get a 30% tax credit for them too! Geothermal conditioners are great systems. Most of the time, it’s the installation issues surrounding those types of systems that block most small to medium sized businesses from getting property owners to green light it. If your business owns its own property, then these are the way to go in hotter/humid climates. I’ve also been looking at a special kind of high efficiency evaporation cooling system called the Coolerado (www.coolerado.com). It only uses 600W per 1 ton module, which is amazing… but it does require up to 4 gallons of water per hour to operate… and the more humid the environment, the less efficient it is. I’m actually starting work on a project now that will try to make real world use of external air (or what I am now calling “passive cooling”) and other techniques like thermal mass and ground sinking (like passive geothermal). Expect an update on that project in a few months. I love the idea. You’re very right. Why would you use inside air to cool somewhere when it’s 54 degrees outside?! That’s craziness! I think you’re great for trying to improve the efficiency of HVAC systems that can be used for small businesses. Our server room sits inside a cooled warehouse, average ambient temperature of 60 degrees, fairly low humidity but a dusty environment. How can I move this air through our server room to keep it cool, yet dust free? How much air do I have to move (per hour) to assure steady cooling? Basically I made the rack itself the entire air management system. As you will see in the post, there are commercial racks now that are designed with this in mind, but I was able to mod a basic APC NetShelter rack with DC brushless fans, some duct elbows, some foam rubber, and standard panel air filters… and it works perfectly! No dust, and the air is perfectly cool. Did you have any further experience in this are or step over a complete solution that addresses humidity, frost and pressure issues? 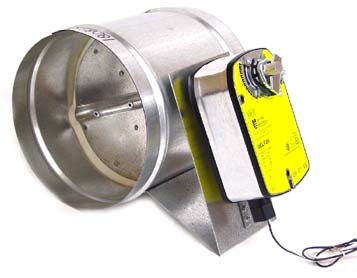 I found a few heat recovery systems like the Vortice H400, I wonder if they could be used in server rooms. I’m fortunate enough to live in an area with a rather moderate climate. I put this type of system into practice here; http://blog.amal.net/?p=1055 and because the building has a rather large furnace room where old 1920’s era boilers sit dead and rusting, I can run outside air through that room where all the boilers and metal sort of equalize the temperature and humidity. I have a set of environmental sensors in the server room and outside. While outside I see wild swings in relative humidity from 5% to 100%, in the server room it stays pretty much around 45% all year round. The internal temperature of the server room will fluctuate from 50F to 75F, but I use a rack from APC that I made air-tight, and I speed control vent fans on the back to adjust for temperature to ensure the inside of the rack never gets below 65F or above 75F.